Whether you need a load of gravel delivered for your driveway or you just need to pickup a yard of mulch for your flower beds, we have what you need! 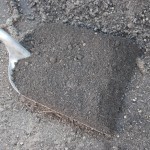 We provide quality compost, soil, mulch, rock, and sand for every project – big or small. If you have questions about product, delivery schedule, or delivery pricing, give us a call at (804) 379-8733! Click on the link below for retail picked-up prices. Our compost is made from rich organic material and aged and heated to proper temperatures. The end result is perfect for mixing into beds and large plantings. Our compost is 100% organic, made with all leaves, fruit, and vegetable waste. Compost promotes plant growth by naturally replenishing the soil's nutrients, decreasing the need for chemical fertilizers that can be harmful for the environment. Benefits of compost include healthier and greener lawns, aid to flower and plant growth, and a smaller ecological impact. 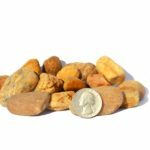 Our premium topsoil is registered with the Virginia Department of Agriculture and Consumer Services as a horticultural growing medium and is high in organic matter. Our blended topsoil is a mix of 60% screened topsoil and 40% compost, making it an ideal all-in-one material for soil work needs. 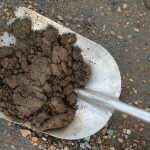 This soil is 100% screened soil topsoil. This is great for areas where soil has eroded or for a better quality soil to fill in empty areas. This soil is unscreened and should be used for projects where planting and landscaping is not a priority. 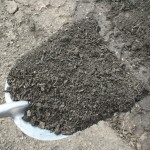 When we screen grindings, there is a lot of soil that is removed. 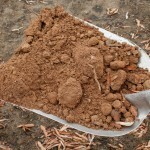 This is contractor grade topsoil. 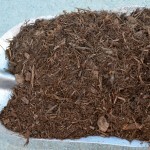 It is better quality than fill dirt, but does not contain enough rich organic matter to use for plantings. 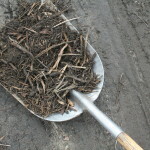 This mulch is hardwood, double shredded, and undyed. It is the most natural (and popular!) option. 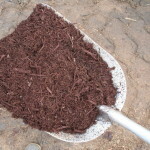 This mulch is dyed, double shredded, hardwood that exhibits a rich brown color and is resistant to fading. 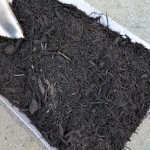 Our dyed black mulch is eco-friendly and the color lasts for a season. 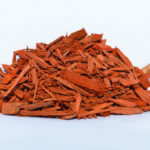 Our dyed red mulch is eco-friendly and the color lasts for a season. 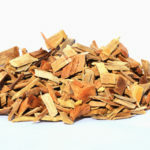 This mulch is wood fiber shredded and tested to meet all federal regulations for playground material. 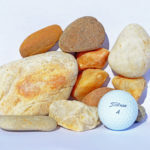 This brown river rock contains golf ball size stones ranging from 1” to 3” in diameter. 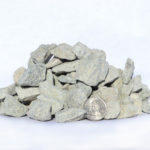 This rock contains pieces of stone ranging from 0.5” to 1” across. 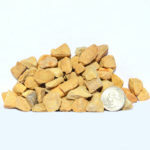 This brown river rock contains fragments of stone approximately 0.75” across. This is used for decorative driveways. 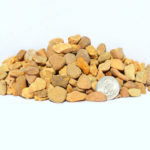 This brown river rock contains pieces of stone ranging from 0.25” to 0.5” across. 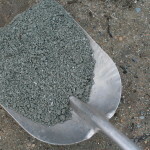 Pea gravel is most often used in driveways, playgrounds, and sidewalks. This rock contains pieces of stone ranging from 0.5” to 1” across. 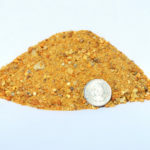 This is the most popular gravel for driveways. This rock contains 50% granite dust and 50% small pieces of granite. 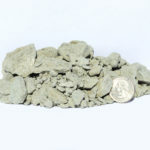 It is a very packable material and works well for patio installations. This rock is fine, dust like, crushed granite. It is used most often for horse stalls, riding rings, or dog pens. 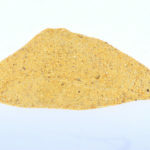 This is very fine sand often used for masonry work. 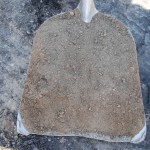 This is courser sand used under pavers or as a soil amendment. This is course, untreated, whole tree mulch typically used on steep slopes.